Word on the vine – this is Space’s last year. Any ideas what they’re gonna do with the land…shopping mall maybe!? …and what is being done for the families and the older generations who keep, and have kept, money coming in for the island businesses in the shoulder months? The Tanit is a family hotel, which was nicely placed outside if the mayhem if San An…so, yet another one bites the dust. I also oubt that the pokitucians will change much, they see uncapable if seeking advice or looking what has happened elsewhere. ..they think they know the answers, but of coure they don’t, they are too insular, always have been. Martin, why do you want Sant Antoni (isn’t that it’s name now?) to be like Bossa? I think you need to aim higher rather that to become equal to Bossa. I’ve stayed in both for extended periods and feel Sant Antoni has got a lot more to offer than Playa d’en Bossa has i just feel the establishments in Sant Antoni need to up their game and become more up market in order to re-attract the right clientele. Many people and clients I know who visit the island say they have ‘no desire’ to visit Sant Antoni and my reply is: you don’t know what you’re missing, let me take you there. Granted I don’t go to the bars there and mingle with the fellow Brits that give the place a bad name but I go there for many other reasons and perhaps I would go to more bars and restaurants if I knew I wasn’t going to be surrounded by British oiks. Change the establishments, changes the clientele which changes the town. 5 years and it could be the latest GAME CHANGER. Imo anyway. Keep up the great work it’s always interesting. San Antonio has much more to offer but Bossa has upped its game. For San An major investment in hotels and attractions (bars, restaurants etc) is the key as people are no longer happy with basic accommodation and bars that haven’t been refurbished in 20 years. We have amazing attributes in San An but need private investment to give us that push required to change the mindset. I think for the image of Sant Antoni to change the west end has to go in it’s current form. Maybe changed into an old town vibe with sensible bars and restaurants rather then the buy one get two free attraction it is now. Once it loses that reputation the rest will become much easier. I’m a big fan of the idea of the west end but it’s current format is dated and the rise of the lucky lucky men is a real problem. Your old town vibe is a great idea. We need an entry level product in San Antonio but we also need to improve and not just put the prices down. Build it and they will come. It still amazes me when people talk about how to change the west end, and their ideas on what we should or shouldn’t do. We live in a capitalist world where bar owners get to decide what to do with their own establishments. No one can force anyone to change their bars or invest money that they don’t have to perhaps attract more customers. It’s hard out there and many bars are not making ANY money at the moment, so to ask for reinvestment is a tricky subject. I have three bars and I like to think 3 of the most modern. But modernity doesn’t also mean customers. I for one think that the west end is too big for the number of tourists we have at the moment, or more like: there aren’t enough tourists for the number of bars… Either way, we can only hope for more tourists or a thinning, cream rising to the top type situation, of the bars. But then the town will be left with empty bars, boarded up with for rent signs with no one interested and that doesn’t look good for anyone and certainly won’t attract more customers. The west end can change, but how it does that is actually a lot out of our (the bar owners) hands. Can we control the hordes of illegal street sellers and drug dealers? No, that’s for the police. Can we stop bars with 40 illegal prs dragging people to their establishment, yes but while one does it, everyone will want to. That’s human nature so it’s down to laws being enforced so that they don’t feel that they CAN and HAVE TO do it. That’s the town hall and polices job to enforce. Can we stop the criminal gangs who operate solely on stealing and pickpocketing every night? No, this is the police. Can we stop illegal bodegas selling alcohol after midnight and literally stealing business to the bars they are set up next to? No, this is the police. And on a wider scale, can we as west end bar owners stop 100s of illegal, unlicensed and uncontracted ticket sellers sending people each and every day to Bossa, rather than giving people the free will to choose to stay in San An? No, this is the police and town halls job. And most of all, can we control the number of beds that are now available to tourists in San An? No. This is down to the town hall to perhaps offer incentives for the refurbishment and reopening of many of the hotels that are dotted around San An that have been empty for years. Seems like there are more and more empty ones each year meaning we are all fighting for the same sized slice of an ever decreasing sized pie. I just ask for our new government to help us by doing their job first and clean up our streets so that we can do our job of entertaining our customers. It would be great to have a street of quality tapas bars. Where old and young can eat and drink like in most old towns in the rest of Spain. There are always late night drinking spots for the young once the oldies have gone home. I know this might not appeal to the young Brits so much, but surprisingly there are a few sensible youngsters out there, even from Britain. I think the west end name needs to be changed into something like Pueblo Viejo de Sant Antoni. We live in hope. San Antonio needs to be a different resort to all others, it needs to rise above them all and become its own. It has everything you need for all types of holiday to the island already, from stuff for kids to do, activities for those of an older generation through to much faster paced activities for those who are looking for more adrenaline based excitement. It needs a bit of updating and some refurbishment for sure, but it also needs to step away from its past and shrug off its image problem. The West End has always been there in one form or another but it is also a tiny part of San Antonio which can be easily avoided if that’s not your thing. Promotion of the great facilities from transport links to great hotels to great attractions and activities on offer, San Antonio has everything you need for an amazing holiday should be the message. Es Paradis and Eden have upped their game this year. Ocean Beach has also expanded over recent years and not just in the music side. The addition of Ocean Mania is a genius move and although it may take a few years to pay off is without doubt a good family attraction. The Nigerian women and luky luky guys are a problem, but that’s island-wide wherever the tourists are. Again, you soon learn how to avoid them, or deal with them firmly and politely and are they any different to the beggars on the streets of Rome or the market sellers around the pyramids of Egypt? I still believe that San Antonio should be the gateway to Ibiza. A sensibly priced resort catering for all types and ages allowing the majority to come and to fall in love with the island. San Antonio should lead not follow. I understand what you are saying if you are a bar owner in the west end, but I still think the main problem is IMAGE. I was talking to a mixed group of youngsters last week in London (early 20s) who are going to Bossa next week. I said will you be going to San Antinio whilst you are there. They looked at me as if I was mad. After trying to explain its good points, they were not really aware of Ocean Beach or even Mambo (which was surprising) but knew everything about Ushuaïa and Hard Rock Hotel etc. The main thing they had been told about San Antionio was don’t dare go to the west end! 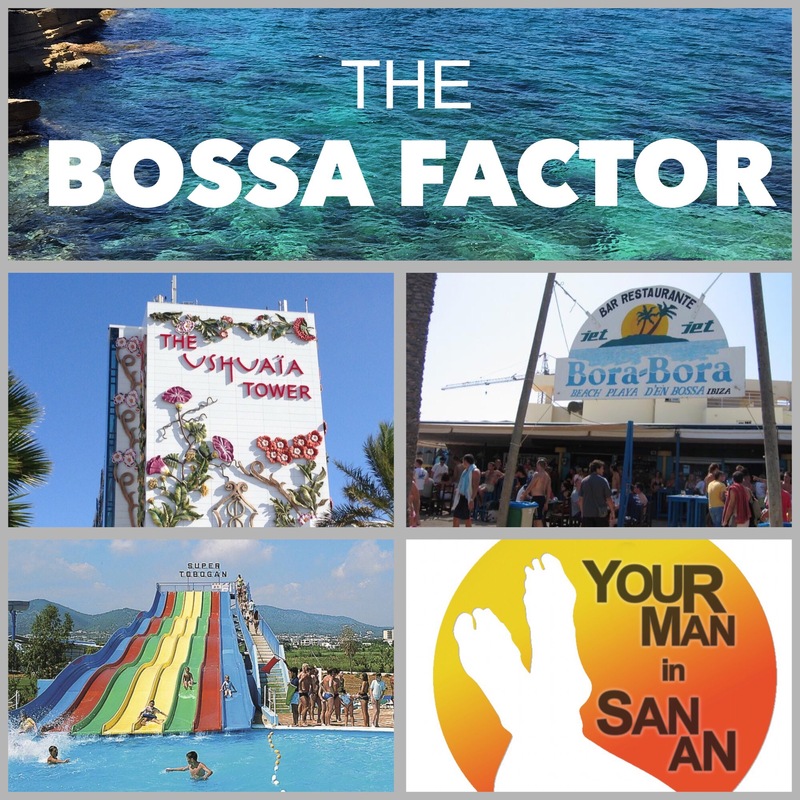 The publicity machine for Bossa is obviously much better, because has Martin said earlier, you don’t hear about the negatives there which are much the same negatives as San Antonio. I spent a lot of happy hours in the west end in my younger days, so maybe that looses me the right to ask for change, but I only want the place to do well and not have to stick up for it every time the name is mentioned . To change the image and clean up the other problems mentioned here is a massive task. I think it’s a massive shame that new more innovative business ideas such as the Exodus boat which would have brought a more luxury image to San Antonio was stopped for no good reason! It would have and given the resort a different appeal for those looking to upgrade from the tacky booze cruise experience currently available. Great shame for San Antonio! Ps I have nothing to do with Exodus personally but live in San Antonio and it pains me to see when the town is stuck in the dark ages while other resorts are moving in to 21st century. Next Next post: ‘Ibiza Winter Residents’: You couldn’t make it up!